I'm exited to share glimpses from our friend Ellie's bat mitzvah held at the Jewish Reconstructionist Congregation in Evanston, Illinois on January 14. It was such a privilege to witness this important rite of passage – celebrating a new voice being heard and joining the other adult voices of her family and community. And what a voice! Ellie and her family gave me permission to share her D'var Torah – the commentary she shared based on the portion of the Torah she studied and recited as part of the ceremony. Not only does she find ways to make the ancient text relevant for today, she also inspires her audience to ask a version of one of my favorite questions: What makes a place feel like home? I would like to thank you all for coming, I know a lot of you can't wait to eat and party and since you all know how much I too love to eat and dance, I assure you this won’t be long. But, it will be worth it. The portion of Torah I just read, the parshah, starts off with Jacob, who has been renamed Israel a few parshas before this one, but that's another story. Jacob, now called Israel, is 147 years old and dying, who wouldn't be, 147 right? He calls for his favorite son, Joseph to tell him that he wants to be buried in the Promised Land, not Egypt, and carry on his legacy. This is not a coincidence because the parsha’s name, Va’yechi, the first word of the parshah, is Hebrew for "and he lived on” or legacy. Jacob calls for his other sons and tells them he is sick and dying. He then blesses them. They will forever have a piece of the Promised Land – but Levi did not receive a piece of land. Levi becomes in charge of all priests, but that’s also another story. Israel, or Jacob, then calls for his two grandchildren, Menasshe and Ephriam, from his favorite son, Joseph, the first-born son of his favorite and intended wife, Rachel and gives them his blessings, equal to his sons, hoping his blessings will be their legacy. They will all become the Twelve Tribes of Israel. Jacob also had a daughter, Deenah, she was not named a Tribe of Israel, but sadly the Torah doesn’t alway highlight the girls. On Shabbat, we bless daughters on Friday nights, saying: May God make you like Sarah, Rebecca, Rachel and Leah. May God make you like Ephraim and Menasshe. Who were these guys and why do we wish that all sons become like them? 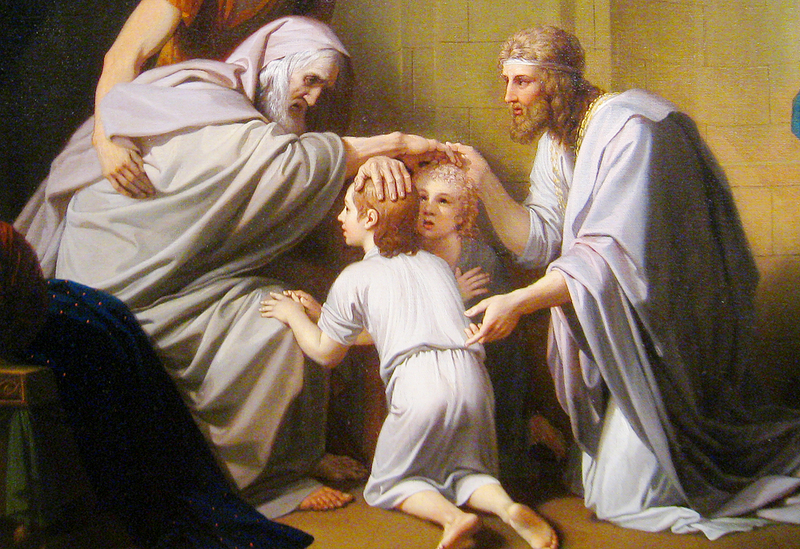 Menasheh and Ephraim, Joseph's two sons, were born and raised in Egypt, a secular society, a place where people did not have strong character or practice the laws of Judaism. Menasshe and Ephraim remained faithful to the morals and ideals of their grandfather Jacob, as they were taught by their father Joseph. "To be great amongst great people is a challenge, but to maintain a high level of spirituality and character when those around you have lost their way – that’s the real test." Jacob chose Ephraim and Menasshe to be his own. Not only were these two boys of strong moral character, but they were also the sons of Joseph. Now, I have a thing or two to say about that. This is a classic example of favoritism. Giving Jacob’s grandsons the same amount of love he gives to his own sons, because they are from his favorite son. Does this seem right? Did Jacob see strong character in people he was already inclined to favor? Favoritism and jealousy play an important and multi-generational role in this story. We see how favoritism and jealousy affected all of the characters. Remember how Joseph was almost killed because his brothers were jealous of him? I wonder...Do children who feel favored like it or not? Do they feel injustice even though they are the favored one? If you look at it one way, my sister was favored because she did not have to live by this rule. Or was I favored because I got much more time and lived through an experience with my mom that she did not? Ok, back to the Torah...did Menasshe and Ephraim notice that they were being favored over Jacob’s sons? Did they want justice or forgiveness for their uncles' children who were overlooked? I felt that my sister was missing out, to have an amazing experience with Harry Potter, as I did with my mother. But I couldn't go back in time and replace me with her, I just had to live with it. Another thing I noticed about this parsha is that Jacob was so quick to decide that he wanted to be buried in the Promised Land – not Egypt – even though he lived there for many, many years. It was a foreign land and he must not have felt at home. I wonder what makes a place feel like home? Is it really your home if the people don’t accept you for who you are? When families immigrate to other countries for opportunity, dreaming of new lands for so long, does it really feel like home? Or when does it feel like home? I would like you to put yourself in the place of a young teen who is homeless. Their family has kicked them out of their house, and they have nothing to eat, or to wear, or clean themselves with. Jacob felt justified when he didn’t bless some of his sons. Is it ever justified for a child to not receive a parent’s blessing? LGBTQ+ youth want a Promised Land too, but they are often forced to wander. Where will they find home? In conclusion, in this parsha we learn that having good character is important. Menasshe and Ephraim became famous in our Jewish ritual in order to pass on the blessing of good character. Dropped off close to 400 bags of assorted toiletries and socks for the Youth Outreach program at The Night Ministry. Lastly, we learned that home is a place where you feel accepted, whether you are Jacob leaving Egypt to be buried in his true home, or a young teen who desires to feel accepted by family and society. I urge everyone to continue to strive for good character and to accept people who may look or act differently. In this way we will all experience home; we will all receive blessings. Now for the thank you's. I have been told not to make this like the Oscars, so this will be short. Thank you, Susan Stone and Kate Kinser, for teaching me great things, that I couldn't have learned on my own. Thank you all of my relatives and family friends, for coming here from far and wide to come for my special day. Thank you to my squad, my Hebrew squad, and my Camp Chi squad, you are all the best. Thank you, Rabbi Rebecca Weiss and Cantor Howard Friedland for helping me lead this amazing service and...always bringing joy, I like joy. And last but not least, my family. Thank you, Mom and Dad for encouraging me to study when I would get the jitters, thank you Mooks for being such a goof and making me smile when I was stressed out. And thank you, Wally, for always being a comfort, even though you aren't here because dogs aren't allowed in synagogue. Now without a further ado, let us continue so we can dance and eat.